Michael Wacha leaves the mound in the fourth inning. PHILADELPHIA — Odubel Herrera smiled when told he was being compared to Ichiro Suzuki and Vladimir Guerrero. He has potential to be known by his first name just like Ichiro and Vlad, too. Herrera is batting .419 (13 for 31) with two doubles, five homers and eight RBIs in the last seven games. “It’s very satisfying to be compared to two legends,” he said. “It was cool to go out there and succeed,” Morgan said. 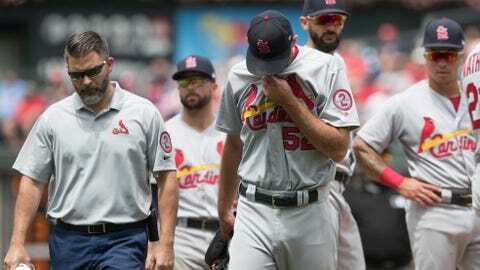 Wacha left in the fourth with a left oblique strain. The right-hander allowed three runs — one earned — and six hits in 3 2/3 innings. He’ll have an MRI on Thursday. Wacha after getting some treatment for his left oblique strain: "Feeling a little bit better. … I'm hoping for the best." Herrera ripped a 91-mph slider from Sam Tuivailala (1-3) off the scoreboard on the facing of the second deck in right field to give the Phillies a 4-3 lead. Herrera has a homer in four straight games. Molina drove a 3-2 pitch the opposite way into the seats in right-center for his fifth career multihomer game in the sixth to tie it at 3. PHILLIES: INF J.P. Crawford was placed on the 10-day disabled list after breaking his hand Tuesday night. INF Mitch Walding was recalled from Triple-A Lehigh Valley to replace him. … Williams returned to the lineup after he broke his nose in the field Monday night. Cardinals: RHP Carlos Martinez (3-3, 2.73 ERA) takes the mound for the start of a four-game set at Milwaukee. He’s 6-4 with a 1.95 ERA vs. the Brewers.